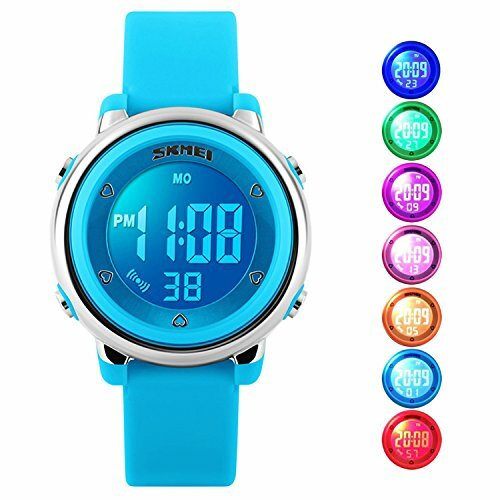 Kids Digital Sport Watch, Boys Sports Outdoor Watches, Girls LED Waterproof Electrical Watch with Alarm Children Stopwatch - Blue | What Should I Say? • LED Lights:Use LED lights, just press the backlight button on the left, children can clearly see the time at night. Digital WATCH: Fashionable sport dial design for kids, sport style outlook. Large Dial and numbers with light, show time clear in the dark. Use EL Lamp, Press "LIGHT" button to see the time clearly in the light. PRECISE TIME KEEPING: Original Movement, provide precise and accurate time keeping for kids. High quality battery which can provide the sport watch strong power. Watch time is super easy to read with high transparency resin wristwatch face and clear digital dial. HIGHLY TRANSPARENT RESIN GLASS: The digital watch glass is made from the highly clear resin material and sealed with the case by high frequency machine. So that the glass is extremely hard and pressure-tolerant for hyperactive kids( girls or boys). WATERPROOF FOR DAILY USE: 50M Water Resistant, HANDWASH, SWIMMING, NO PROBLEM ! Feel free to wear the digital sport stopwatch when kids are showering, swimming and diving. NOTE: Please DO NOT press any buttons in the water or wear this wristwatch for longtime underwater activities - such as diving, ect. Too much water contact or usage in extreme Hot or Cold temperature will shorter watch life. COMFORT: High quality silicone bandstrap, plus spray handle oil, the strap is soft and comfortable and environmental friendly for kids. This blue digital LED electrical luminescent waterproof watch is very suitable for girls or boys outdoor play.